As an Australian, I've long supported the 'waves of migration theory'. Admittedly I'm not an archaeologist or geneticist so this is just a layman's opinion. But if you look at our First Nation's people's across the continent of Australia, there is a definite physiological difference between these groups. While not accounting for evolution obviously because I'm not a geneticist, it seems obvious that there were waves of migration with the newer groups coming in from the North pushing the older groups down. 60,000 years ago modern humans expanded from Africa into Eurasia, finally reaching Australasia...around 70,000 years ago. The basis for starting all these population expansions in Africa has really crumbled away. Now it is just a mantra, that we came out from Africa, despite no African DNA from earlier than 8000 years ago and a wealth of archaic Homo sapiens fossils across Eurasia. Time to move on and recognise we are dealing with a a large population of humans spread across Eurasia, with significant 'Into Africa' events during the timeline of Homo sapiens. This new article is a start but It fails to address various major flaws in Recent Out of Africa. Recent genetic evidence has shown that present-day "Europeans" have no relation at all to the people to arrive there around 45,000 years ago, so what's all this anti-migrant nonsense about then? If "Europeans" only fairly recently turned "white" then that means the true Europeans were not "white". This all makes it perfectly acceptable to take the land from the "Europeans" living there now as 'they' themselves did the same to the people that were there first before them. As new technology, produces new data and corrects old data. Some of which is obsolete. Some needs to be correlated with new evidence. And then, we get to start all over again with future research. We are a long ways off from anything that could be considered as a Final, Definitive Conclusive Proof. But many people do not have the patience or vision for the long haul. They want it all, right now! They want to hear that what ever they think they learned in school, no matter how many years or decades ago. Must still be enforced as official dogma. a_wf_E, your racist petticoats are showing. Demographics dictate who populates any place. And your definition of "Freedom" is infantile. Either freedom is universal or it has no meaning. What you want is called "license". To allow you to act as wantonly as you desire without any need to treat others with kindness and respect. You just do not want to be part of a civil society. @leetennant, BruceFenton: The article is clear on that "all present-day non-African populations branched off from a single ancestral population in Africa approximately 60,000 years ago" and that "the recent dispersal contributed the bulk of the genetic make-up of present-day non-Africans". Specifically in Australia it looks like one entry event (and I don't even know what "no African DNA earlier than 8000 years ago" would refer to - we are all Africans). What is less clear is how the small scale, earlier dispersal events should be modeled. Thinking that human migrations-- and in "human" I include Denisovans, Neanderthals, and probable other subspecies we have not yet discovered enough evidence to substantiate, and in some cases never will-- are simple and only happened one time is risible to say the least. There's always someone to point over the horizon and say, "It will be better over there." Sometimes they'll even be right. But if people go that way, they're persuasive whether they're right or wrong. We'll never see the traces of the ones that failed. It's the nature of the business. @whitefree, your ideology doesn't seem to have much to do with reality given your handle. If your ideology trumpets wiping out people from where they already live, be prepared for them to turn into right wingnuts and start attempting to exterminate you. Which, if you'll notice, is already happening. Not that I advocate it; I'm just noting reality. If that disturbs you I suggest you reconsider your own right wingnut attitude. Intolerance against the intolerant strikes me as justice. I might demonstrate in the streets against intolerance of the meek and mild; I am less than militant against the slaughter of the intolerant. If you want help stop the indiscriminate killing, because as far as I'm concerned whatever happens to the intolerant is evolution in action. Simple as that. Let me put it this way: if you cannot control your intolerance you should be eliminated from the gene pool and you will be. There might be a lot of suffering between now and then, but you contain the seeds of your own destruction. I believe this is just as true of all sides. We are in agreement. My comment wasn't meant to imply that we didn't all come from Africa. 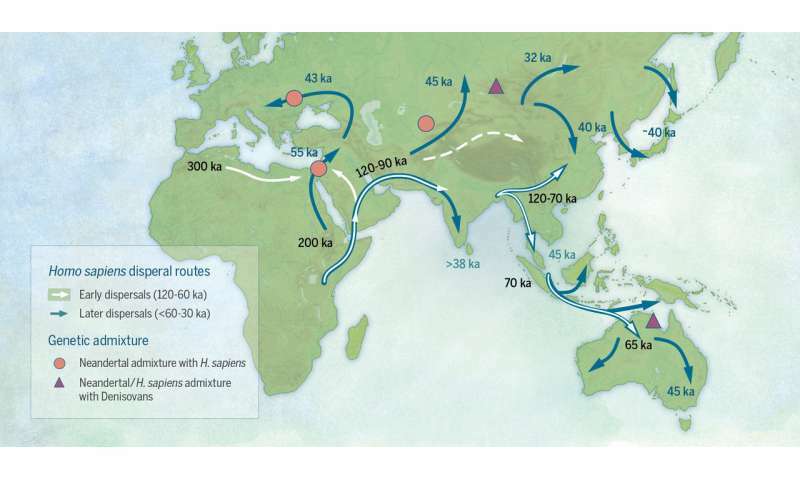 There are solid genetic reasons for accepting the Out of Africa hypothesis at this stage. But I've long thought the waves of migration theory was the most likely explanation for the diversity of Australia's First Nations people. Under all that black fur chimpanzees have light colored, almost pink skin. As human ancestors began to lose their hair and gain increased numbers of eccrine sweat glands in order to remain cool in the African sun as forests gave way to savannah and bipedalism emerged, that pink skin gave way to darker pigmented skin for protection against UV damage and cancer. Recent research shows skin pigmentation in Africa is very complex. The palms of the hands and soles of the feet of dark-skinned humans tells the tale. It is the same color as the skin of so-called whites. Thus, tens or hundreds of thousands of years ago, or even more than a million years ago as human ancestors left Africa the genes for lighter skin were there and were brought back to function by selection for vitamin D production to combat ricketts, a debilitating condition which strikes the young particularly hard making it difficult to reach reproductive age. The article states that modern non-Africans branched off from a single ancestral population in Africa approx 60,000 years ago, this is wrong, indeed I have already shown it to be wrong several times in articles and in my book. Just saying it repeatedly does not make it so, it is nothing but a mantra. That a recent dispersal (approx 60,000 years ago) contributed the bulk of the genetic make-up of modern non-Africans is well-established fact. No African DNA older than 8000 years means we have never recovered DNA from human remains in Africa older than 8000 years. Yes, Australians supposedly arrived in one group and became isolated, then somehow interbred with two other human sub-species while isolated. There was no 'small-scale' earlier dispersal to model, there was a vast population spanning the globe. Hope that all helps clarify matters. I'm not going to respond to most of this but where did you get the idea that Australian Aboriginal people subsumed another human species post-arrival? There were no other human species in Australia before their arrival. Are you confusing Australia with Indonesia and the Pacific? That's a pretty big mistake. The genome of Australasians (certainly in the Northeast) has been found to include significant contributions from two hominins Southern Denisovans and a Denisovan-like hominin. The interbreeding with one of these populations has been dated to 44,000 years ago, long after the ancestors of modern Australasians became regionally isolated (suggested to be approx 65,000 years ago). The only flag for interbreeding between Denisovans and modern humans is in this region suggesting the interaction occurred East of Wallaces Line. Clearly, we need to rethink this 'isolation'. I'll be sure to file your book along with Rick Warren's should I ever have the misfortune to run across it. That DNA has only been found in small groups in Northern Australia, which clearly came through in a later "wave" from the Asia Pacific. But I'm sure your book is way better researched than your comments. Did you read the first line of my comment where I said, "certainly in the Northeast"? As for your remark that it clearly came in through a later wave, the multiple waves theory was destroyed by a series of genetic studies during late 2016. My work is very well researched and incorporates the cutting edge of scientific research - not old debunked speculation. "The history of anthropology is replete with scientific racism, and the news that the Australians might represent the oldest human population brings dark memories to the fore and stirs old arguments. 'I think the majority of anthropologists are tinged by racism,' Allan Wilson said to us in conversation, 'as most of us are, and that their science hasn't been a quantitative one and an objective one'. These data from Berkeley are quantitative and objective, and Wilson confesses he is 'very worried about how to present this in a responsible way'." "This could indicate that there were multiple, smaller dispersals of humans out of Africa beginning as early as 120,000 years ago, followed by a major dispersal 60,000 years ago"
At this stage, I'm not sure what you're arguing @BruceFenton. Humans started migrating out of Africa as early as 120,000 years ago. Remains have been found in China that have been dated to between 70,000 and 120,000 years ago. Modern humans reached Southeast Asia and Australia prior to 60,000 years ago. Then a major wave left Africa 60,000 years ago and this major wave then joined the other existing populations, interbreeding and subsuming them. That's why all modern non-African humans are descended from this wave.